The Chronicles of Pendragon Hold: Why Ira Flatow got the job at Science Friday, and I didn't. Why Ira Flatow got the job at Science Friday, and I didn't. Hello, and welcome to the Friday edition of The Chronicles of Pendragon Hold. Now, just because we had an edition posted this Friday is no real reason to expect it to happen again NEXT Friday, so don't get used to it. Today's episode involves tires, wheel bearings, plastic ear ring post liners, dead dogs and the buzzards who love them, and of course, goats, and not necessarily in that order. If you actually believe there's rhyme to this reason, you are most charitable. Driving down the road on my way to somewhere other than The Hold, I had the opportunity to ease my car thru a crowd of carrion lovers, who had happened upon, (as only scavengers can) an unlucky mammal on the side of the road. Now, I know what you are thinking, and I can assure you that this animal was NOT the victim of my still simmering rage against that pair of murdering mutts who killed my friend Lola. No, although I am fairly sure that these remains were canine in character, I have no idea what animal it was and who might have run it over. Whatever, this pack of hungry road-kill cleaners did there job well, and there remains nothing to tell the tale of a dog's life, or rather, sudden lack of it. Anne, I was tempted to take pictures for you. Only a select few of us know why. The front end of our car, a Ford Focus, has an appetite for tires, and finally had worn down the front pair to the point that I had to intervene and retire them before a belt departed that passenger side tire, it was so worn down; all the wear bars showing on the driver's side. Before that I purchased a hydraulic jack and jack stands and got beneath the beast for some serious exploration in search of the nasty noise that was coming from down under. It turns out that a sway bar link had parted on the bottom end and had to be replaced, which, thankfully, with a little research, I figured out how to do myself. Then, yesterday, I visited the tire store and had the two front tires replaced. Now, a troubling rhythmic sound is very evident that the tire guy suggested might be a worn out wheel bearing. I got on the net and researched THAT topic and so far, as best I can discern, there is no CLEAR evidence that the bearing is at fault. 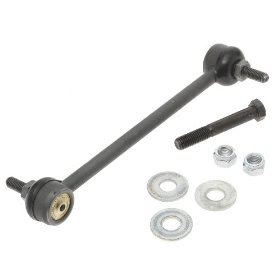 SO, I am going to replace the OTHER sway bar link, which probably is about to fail as well anyway, and THEN I will see if that sound is still there, although I have entertained the idea that the sound COULD be coming from one of the old tires in the rear of the car. You see, car sounds seem to always come from someplace OTHER than where they are actually emanating from, making it so easy for auto mechanics to get return business when the obvious remedies turn out to not remedy anything. Hopefully, I will be able to nail down the culprit before something bursts into flames. I might have reported previously that THE Wife got an extra hole punched in one of her ears. Anyway, she happens to be rather sensitive to nickel, a common contaminant in jewelry, so we had to get her some plastic liners to cover the posts of her ear rings as to keep her ears from swelling up. Hopefully I will be able to get her some pure sterling silver ear rings, perhaps for her birthday, that she isn't allergic to. MAYBE......grin. The tomato garden has pretty much wound down and there are only a few fruits left to mature. The cucumbers never did produce one decent cuce, and the beans were all buried in an excess of marigolds. The strawberries did just AWFUL this year, and neither the blueberry bush OR the fig tree produced any fruit. Sigh. Next year I'm getting serious and will build some raised beds, which have a proven track record of producing real results in the past. The terrace garden will be restricted to herbs, which it hosts very well. 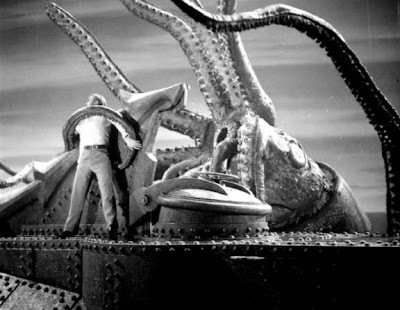 Just recently I suppose all of you may have heard about the sudden appearance of aggressive squid in the waters off San Diego. These rather nasty creatures normally inhabit waters much deeper and further South, but have now appeared in much shallower waters, in the great numbers they are known to appear in, and have taken to buffet around and man-handle divers. Most divers are leaving these areas to the squid, while others are getting into the thick of it, putting their lives in danger, since these inquisitive and predatory creatures have a habit of trying to rip the masks and hoses off of you. There are plenty of theories as to why this is happening, and none of them are good. But of course, we all know there's no such thing as climate change, now is there? We are getting regular doses of almost daily rain now, and between that and the stifling heat and humidity, we haven't done much out in the back forty. Once it cools down and dries out a bit, I might try and get that chicken coop built, and have it ready for habitation come next spring. Well, that's all that's happening here at Pendragon Hold, that acre of sand on the edge of suburbia, where real life trumps fantasy on a regular basis. Be well; I have to put the dragon back in it's cave. If it lets me, that is. This entry was posted on Friday, July 17, 2009 at Friday, July 17, 2009 . You can follow any responses to this entry through the comments feed . Good morning! My tomatoes did just ok this year. I tried the 'prune the suckers' method this year; pruned off all the suckers, supposed to make less but bigger fruit. Well, I WON'T be doing that next year. Our harvest was pitiful, to be nice. Not much fruit, not even very big. It was tasty, to be sure, but low production. My plants are pretty much done now. It really got too hot for them in June and they refused to set more fruit. I'm only keeping them alive now for the cuttings I will take off the top to root for more plants to set out in a few weeks. I've got to dig up the other bed and get it ready, then in goes the new cuttings! I hope to get another crop later when it gets cooler! I'll let you know the progress! The jalapenos are doing very well, and the Caribbean red hots are just now turning color. Yum! In addition to new plants, I set out two tomatoes that I had in 5 gallon pots last summer and moved into the sun room for the winter. In early spring they stopped bearing much fruit. The vines were about eight feet long. When I transplanted them to the garden I buried the vines. I have a jungle with the best tomato plants I've ever raised. They are doing much better than the new plants. I'm going to try moving four or five plants inside again this winter. Have you got your car fixed?